I got a bit behind on this blog when the computer went down then I got hit with serious deadlines. I'm back and there is a lot going on. I just got Makita 2.5 hp compressor (MAC2400). It keeps up with my volume spray painting and is quiet. Odd thing is I bought its evil twin a few years ago. A Master Power MPAC521, which looks almost the same. It was frighteningly loud, could not really keep up, and filled the garage with smoke. After only about 30 hours of work over the last 3 years, it finally could only produce about 20 psi. What a relief it is to have the Makita. Where in the World are Henk and Joke? I have not been able to contact them previously. A seadog moored next to them finally put us in touch. I’m going to try to set up something here to track where they are when. Hence the title. They are in Curacao now. There are other world sailors also that I will highlight soon. 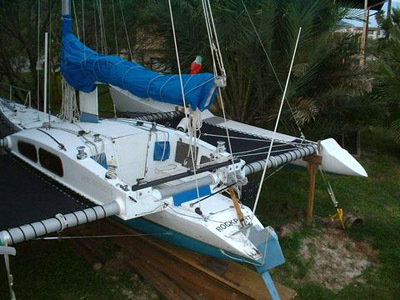 I found this beautilful old style KHSD D-30 demountable trimaran on the web somewhere. I have no idea whose boat it is. I see it has the old style spade rudder that could kick-up even while turned. You can see all the informational PDFs on the KHSD website by simply adding the letters “pdf” ahead of the front slash at the site address. and look there, pulling a wakeboard in a storm. Guys, be careful. Another cat featured with no designer listed. IBEX is next week in Louisville, KY. I knew that the PVC and SEN foam cores we use to build boats had some thermal insulation value but I didn’t think it was as good as house construction insulation foam. At the Fiberlay design conference I learned that it is almost as good as the insulation foams. For example 90 kg Airex is 0.24 BTU.in/sqft.hr.F which comes to R 4.2 per inch. Craig Riley tells me that the PET foam gets wildly even better results when in a vacuum. Sarabi, Barry and Karen’s custom 56′ KHSD catamaran is back in the Northwest after a lap around the Pacific. This very gorgeous boat has an Aerorig. Rumor is she might be for sale. Contact me for now. What ever happened to the old Shaman? 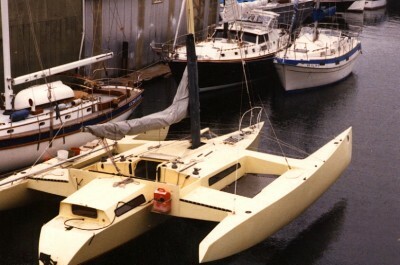 I began building my first trimaran, Smoholla the Shaman the year that I began architecture school. That was 1977. I first sailed her the summer that I graduated. 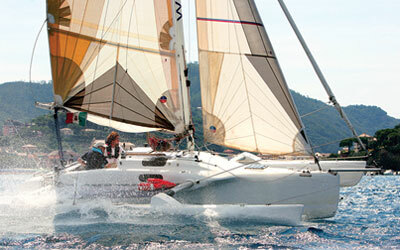 It was my home for a couple of years and at the same time, the fastest sailboat in Puget Sound, until Chaak came along. She was my CM construction method prototype. She lives in the Chesapeake now, looking different but still sailing. How nice. I found these videos on YouTube of the kHSD 65 catamarans Fury. They are all aluminum and certified for over 100 passengers. 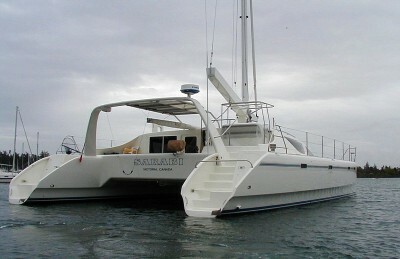 There are are least three and maybe four of the Fury catamarans in Cozumel and Key West. They must have been synergistic. The original owner managed to get three or four boats out of the same set of plans. YouTube has a whole raft of Fury videos. Check out this video from the KHSD 55 charter catamaran Palmetto Breeze. She sails out of Charleston, SC. Historic Charleston. athletic women in bikinis; whats not to like? Sorry about the ads. And don’t try to pause it to escape the buffering. It will flip you back to zero when you light it up again.